How to Grow Onions in Containers | Grow This! Onions make an outstanding container vegetable. While there are dozens of different varieties of onions, most will thrive under the same basic conditions. Here are instructions and tips on how to grow onions in containers, even if you’re a beginner gardener. Onions can be generally divided amongst sweet onions and pungent onions but come in many different shapes, sizes and colors. Red, white, yellow and Spanish onions are among the most popular cultivars. Check with local growers to determine if there is a variety that does better for your growing zone. Onions also have different daylight requirements and may either be classified as short-day or long-day. Short-day onions form bulbs with 10-12 hours of daylight and are best for southern regions. Long-day onions need 14-16 hours of daylight to form bulbs and are best for northern regions. Both types can be grown indoors in containers and will do well under grow lights with a timer. Green onions are harvested before the bulbs fully mature. They are great for container growing and can usually thrive in smaller pots. Onion containers should have at least 10 inches of soil depth. The diameter can be as large as you can accommodate but keep in mind that each onion needs about 3 inches of space to grow. A 5-gallon bucket works fine for growing 3 or 4 onions. A large planter box works great but you can even use a plastic tub. Be sure your container has good drainage holes and try to elevate it a little bit off the ground. Onions should be planted a few weeks before the last frost of the season and harvested in the late summer before temperatures cool off again. Onions grown from seed take several months to mature. Place onion containers where they will receive at least 6-8 hours of direct sunlight per day. Check your seed packet to be sure your specific variety does not require partial shade. Onions can be grown indoors but keep in mind that they need cooler temperatures while the seeds germinate and hotter temperatures for the bulbs to form. For this reason, it is often best to grow onions outdoors and let Mother Nature take care of the temperature curve. 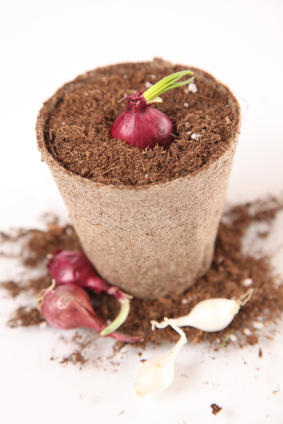 Onions grown in containers will do best in well-drained loamy soil with a neutral pH. Enrich the soil with lots of mature compost before planting and the onions will require little care other than light and water for the remainder of the growing season. You can grow onions from seed, sets or transplants. Growing onions from seed takes the longest but will give you the access to all cultivars. Transplants give you a head start on the long growing process but may have limited cultivars to choose from. For fastest results, grow onions from sets. They are also less prone to disease. However, only a few types of onions can be grown from sets. Sow onion seeds indoors 6 to 8 weeks before the last frost of the season. In shorter growing zones, it’s best to get a head start as onions grown from seed take about 4 months to mature. Sow onions about ½ inch deep and 1 inch apart. Check seed packet for specific sowing instructions for your particular variety. Be sure to use fresh seeds each season as onion seeds are short lived. Transplant seedlings outdoors once they’ve reached about 3 inches tall. Best to harden them off before leaving them outside overnight to avoid shock. Transplants can be planted in outside containers about 4 weeks before the last frost. Be sure to space them at least 3 inches apart. Bury the lower stem up to where the leaves start. When purchasing transplants, make sure they are firm and dry to the touch. Plant onion sets 4 weeks before the last average frost. Bury each set pointy end up, under about 1 inch of soil. Allow 5 inches between sets. Onions grown in containers usually need more water than those grown in garden beds. Ceramic pots in particular tend to dry out fast. Keep the soil slightly moist. As soon as it dries out, water again. Be aware that onions may look healthy even when they need water. Early on, transplants tend to need more water than onion sets. Even in containers, use mulch to help retain the moisture but be sure to keep an eye on them. Onions do not need much or any feeding if they are planted in nutrient-rich soil. However, container onions will benefit from the occasional feeding. Use a compost tea, but avoid fertilizers that are high in nitrogen. They make for leafy plants but poor onion bulbs. When onion bulbs begin to ripen the tops will yellow and start to fall over. When this occurs, bend the tops down to expedite their ripening. Once the tops turn brown, pull each onion bulb. Lay them out to dry for a few days. Handle them carefully; any bruising can lead to rot. You can harvest the green tops of most cultivars once they’ve reached about 6 to 8 inches tall to get green onions (sometimes called scallions). These delicious edibles have a milder taste than onion bulbs and are best when young and tender.